"This a simple glaze, and can be made in either a double boiler or the microwave." In a double boiler, melt together butter, chocolate, and syrup. Alternatively, you can melt the chocolate in the microwave, and then blend in the other ingredients. Pour glaze while still warm over cake. 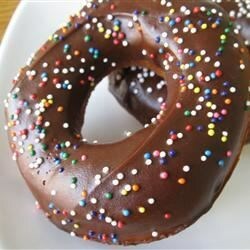 A simple but decadent chocolate glaze that spreads on easy. A good recipe. I added some vanilla extract too. It set up well, and stayed nice and shiny. this glaze was so fast and easy, not to mention delicious. I've also made this glaze with milk chocolate chips instead of semi-sweet chips.